Apple Watch Series 3 Brand New Unopened Box. Condition is New with tags. Shipped with USPS Priority Mail. The two-piece strap is available in silicone rubber, making it a practical and light choice for working out. It has a round face with a brushed finish and a digital display. Ideal for wearing outdoors, it is made with a compass so that you can easily find your way whenever you hike or travel. The Prospex version of the Monster is actually a more refined Monster. It’s given a more intricate dial finishing and tad less the blinding glow. Its black, hard coat and the 4R36 powerhouse entices lot more than you think. Michael Kors Access - Men's Grayson Gold -Tone Smartwatch - MKT5026 New. Shipped with USPS Priority Mail. Fossil Smartwatch - Q Crewmaster. Shipped with USPS Parcel Select Ground. Ocean glass fibre reinforced polyamide case with a ocean silicone strap. Fixed ocean glass fibre reinforced polyamide bezel. Digital dial. Dial Type: digital. Quartz movement. Scratch resistant polyamide crystal. Round case shape, case size: 46 x 46 mm, case thickness: 15.7 mm. Tang clasp. Water resistant at 50 meters / 165 feet. Functions: hour, minute, 24/7 tracking, alarm, gps tracking/ navigation, altimeter, weather, activity based recovery time, gps speed and distance, sleep tracking. Sport watch style. Suunto Spartan Trainer Multifunction Sports Watch SS022670000. New ListingFossil (LATEST model - Gen 4) Sport Touchscreen Sport Smart Watch 43mm - MINT! Fossil Q Sport Touchscreen Sport Smart Watch 43mm- Barely Used, MINT. Condition is Pre-owned. A tempered glass screen protector has been kept on the watch since day one. As you can tell from the photos this watch is in great shape. You may see some dust on the watch due to the high resolution photos, but there is no damage. This watch was 250.00 new, I barely wore it, and kept it in a felt-lined watch drawer. My loss is your great deal! Flawless operation, latest WearOS update. Comes with charger, box, and literature that came with the watch. THE PICTURES SHOW THE ACTUAL ITEM YOU ARE BUYING. IF IT ISN'T IN THE PICTURES, IT'S NOT INCLUDED. WHAT YOU SEE IS WHAT YOU WILL RECEIVE. In good condition. It is fully functional. The band is missing the looper. Timex Ironman Run Trainer 2.0 GPS Sports Digital Elite T5K743F5 Wrist Watch. Condition is Pre-owned. Comes with the heart rate monitor strap as well. In good work conditions a few marks on the face from some wear, but no cracks. Model: FTW4011. Classic design. Modern technology. Smartwatches powered with Wear OS by Google are compatible with iPhone and Android phones. Touchscreen smartwatches powered with Wear OS by Google require a phone running Android OS 4.4 (excluding Go edition) or iOS 9.3 . This Nike Oregon Series is working great and in great condition. The crystal is free of any major scratches. Any that exist are so insignificant they could not be captured in the photos. It has a battery saving feature that allows you to set it to shut down after your chosen amount of hours. Very nice condition but needs CR1216 battery. 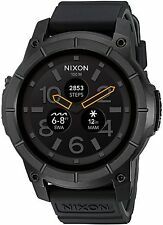 Nixon The Mission Smartwatch Black The watch has a small scratch on the metal as show in the picture but really isn't noticeable when worn. No scratches on the glass screen. The band is the larger band cause I have a big wrist. Comes with charger and orginal box. Free 2-Day Shipping! Guaranteed 2-Day Delivery! Watch screen: OLED touch screen. (need to install the App). Watch band: Silicone material. Watch buckle: Stainless steel. Watch band thickness: 3mm. Watch band width: 15mm. Watch length: 250 mm. Waterproof IP65: No problem for wash hands or take a shower. This watch is Seiko Astron GPS (SSE053J1). There is an inscription at the back of the watch. Overall, the watch is in perfect condition, and works perfectly. There is no scratch in bezel and the watch is ready to be worn. Very cool piece to have. Thanks for your interest! New ListingFossil Smartwatch - Stainless Steel w/extra leather band. Fossil Gen 1 Smartwatch - Stainless Steel. Condition is Pre-owned. In good condition with usb charging cord/ Also include tan leather bands. Only accepts Paypal and ships fedex. Thanks for bidding. Stainless Steel Band. Included are: Watch & Manuals in Box. Accuracy: ±30 seconds per month. battery life: 7 years on CR2016. Economical?. Perpetual calendar (until February 28th 2100). Case Depth. Case Material. Strap Material. Case Width. 7 Year Eco-Drive Power Reserve. Luminous Hands and Markers. Overcharging Prevention Function. I will respond ASAP! Closure: Safety Strap Buckle. Condition is Pre-owned. I have worn and loved this watch but am consolidating the collection. Any wear is very minor. Excellent, almost mint condition. Adidas Micoah Smartrun Watch. Condition is Pre-owned. Shipped with USPS First Class Package. 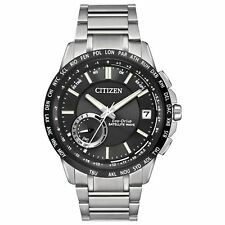 Dial Color: Black multifunction dial with silver-tone stick indices, three hands, subdial, date window and Citizen logo. Case Material: stainless steel. Band Material: stainless steel. Case Size: 44MM. *Same Day Shipping* GT08 Smartwatch Available!!! The strong build and a powerful battery of Traverse Suunto can help guests explore hour after hour. 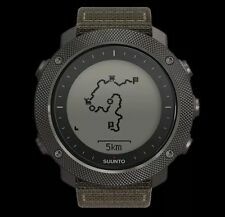 Suunto Traverse Alpha Stealth. Full manufacturer warranty:2 YEARS. The sale is regulated by the D.Igs. The watch needs to fit the owners wrist without being too heavy or getting in the way of activities. A clean and easy-to-read blue face, along with a no-nonsense ability to access the watchs different functions. Dial Color: Black. Shape: Round. which is typically above par. Band Color: Silver. Case Material: Stainless Steel. Fossil Smartwatch - Stainless Steel w/extra leather band. Easily check the time with a GPS watch. These watches have a GPS, so you can get around in any location. The bands are hypoallergenic, so these titanium watches will be a great fit for people with allergies to certain metals. They are crafted from very strong materials, which will easily withstand frequent wear and tear. Featuring soft designs, polyurethane band wristwatches are pleasant to wear and won't distract you during your day. These polyurethane watches have lightweight builds for an extraordinarily comfortable fit. Analog watches display the time in a wide range of different ways, from Roman numerals to thick lines or numbers. Thanks to their stylish and functional displays, you can pair them with any look. Digital watches often have different features and functions, allowing you to choose one that has just what you're looking for. They generally have backlighting, so you can easily see the time in poor lighting conditions. 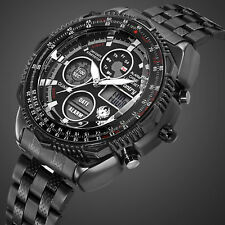 For GPS wristwatches, what are some of the top selling products on ebay?